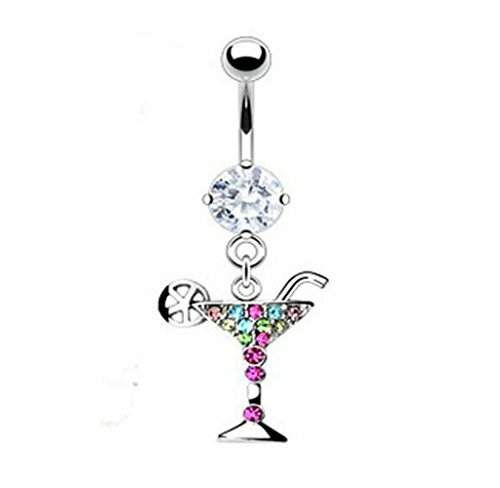 Shop For Martini Glass Belly Ring at ShopWorldlux: check prices, availability, deals & discounts. 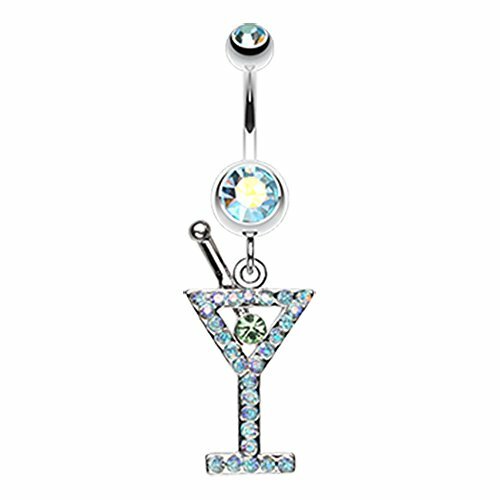 Get Martini Glass Belly Ring to meet your needs at Shop Worldlux. All of our materials are certified for body piercing jewelry. Measurements: Size and length. Please clean area of interest and product before use. Ex: Alcohol pads. Please double check metal if your allergic to certain metals. If unsure how to apply, take product to a professional piercing store. Enjoy! Dangling martini glass belly button navel ring dangle with multi color gems. 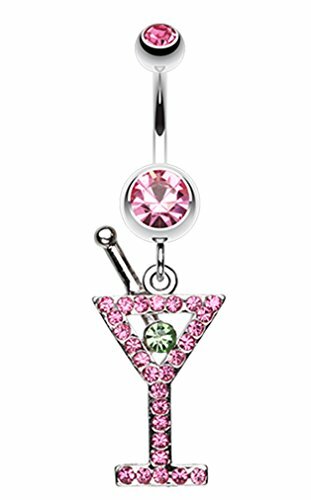 This navel piercing has a 316l surgical grade stainless steel curved belly ring bar. 14 gauge 3/8". 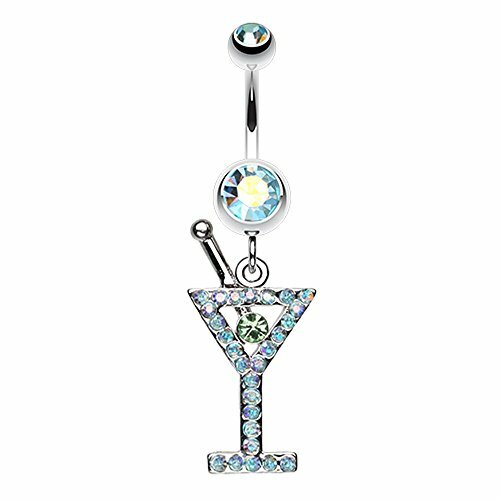 Very cute and very popular martini design and full of quality gems.. 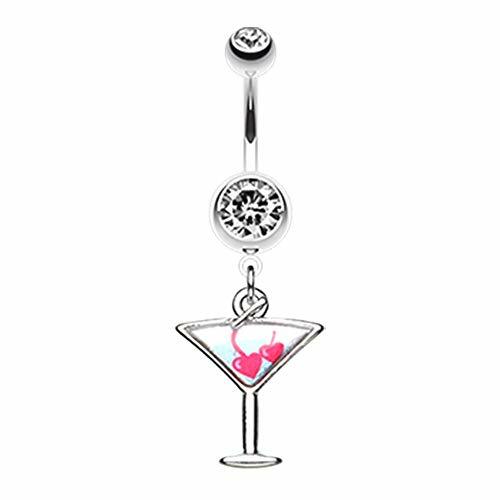 The martini glass and solitaire setting are rhodium plated for a finish that is guaranteed never to fade or tarnish. Unlike most of our competition, we do not plate our items in inferior silver. All our plated items are plated in rhodium which is made of platinum (more precious than gold) to insure that our customers will be able to enjoy each piece we offer forever without ever having to worry about fading, chipping, or tarnishing (common problems with silver plated items sold by others, BUT NEVER US) The 14 gauge curved barbell is 7/16" and crafted in 316L stainless steel. 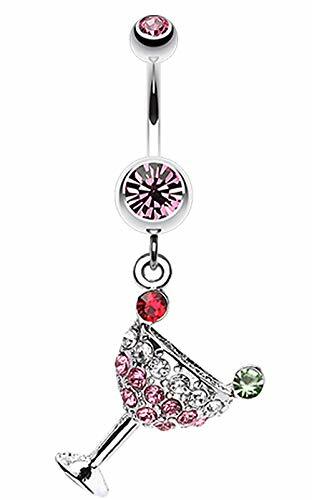 Cute navel ring featuring exquisite gem stones! 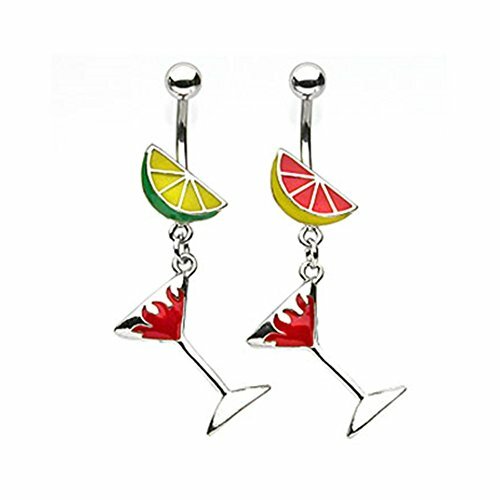 Celebrate a day or evening out with this fun item! Remember to check in with us regularly as we are always updating our inventory to bring you the latest body jewelry! ✯WEAR: This awesome item will complement any outfit, whether at work, lunch with friends, a night on the town, or just having fun on a well-deserved vacation. 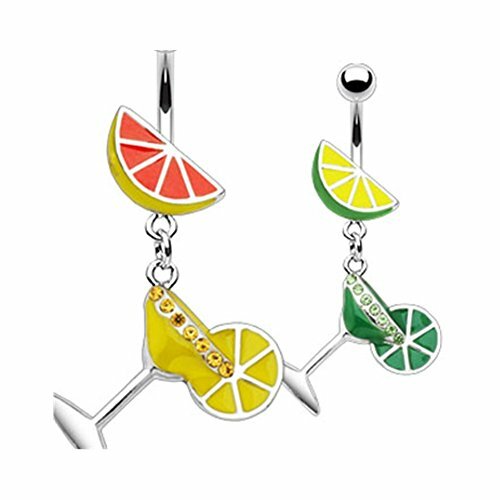 ✯GIFT OPTIONS: This item may be given as a gift to yourself or a loved one. ✯PACKAGING: Individually hand inspected for 100% satisfaction. 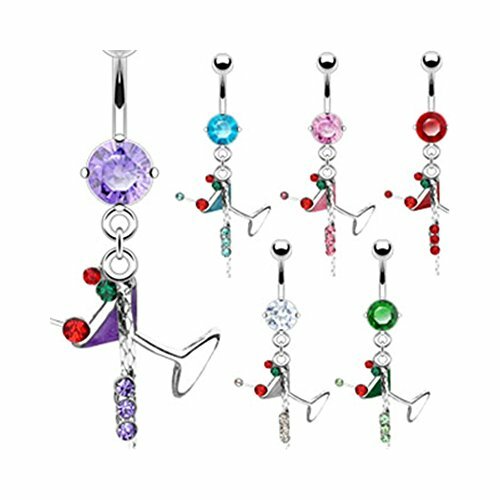 Your beautifully crafted body jewelry piece will arrive in a DAVANA gift box. ✯CARE RECOMMENDATIONS: For a long lasting and vibrant look, avoid direct contact with heat. You may consider removing this piece of jewelry prior to showering/pool/etc. Avoid solvents, chemicals (soap), and limit exposure to perfume or body cream. Dry your jewelry with a clean soft towel or cloth. ✯COLORS: Due to lighting, monitor brightness/contrast, etc., there may be slight shading differences from the actual item. 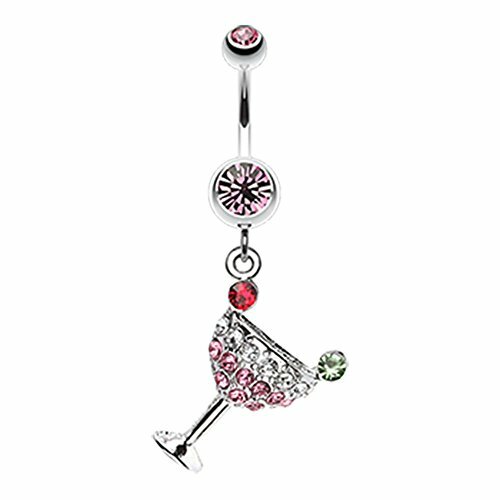 Adorable navel ring featuring exquisite gem stones! 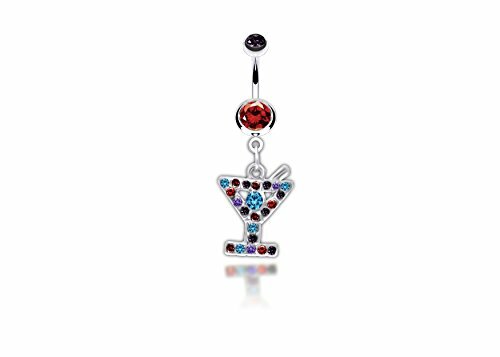 Celebrate a day or evening out with this fun item! 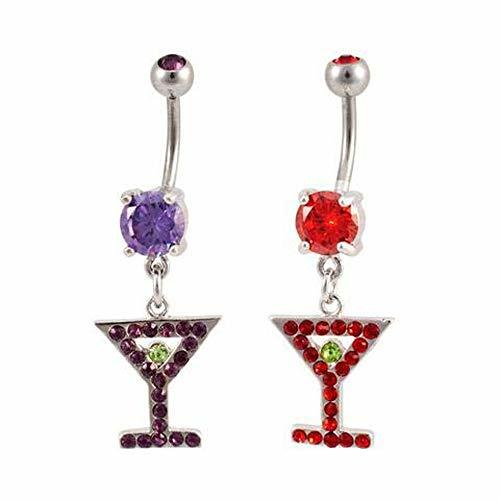 Remember to check in with us regularly as we are always updating our inventory to bring you the latest body jewelry! ✯WEAR: This awesome item will complement any outfit, whether at work, lunch with friends, a night on the town, or just having fun on a well-deserved vacation. ✯GIFT OPTIONS: This item may be given as a gift to yourself or a loved one. ✯PACKAGING: Individually hand inspected for 100% satisfaction. Your beautifully crafted body jewelry piece will arrive in a DAVANA gift box. ✯CARE RECOMMENDATIONS: For a long lasting and vibrant look, avoid direct contact with heat. You may consider removing this piece of jewelry prior to showering/pool/etc. Avoid solvents, chemicals (soap), and limit exposure to perfume or body cream. Dry your jewelry with a clean soft towel or cloth. ✯COLORS: Due to lighting, monitor brightness/contrast, etc., there may be slight shading differences from the actual item. 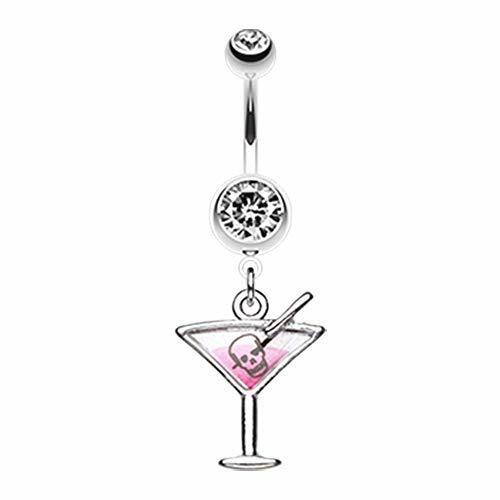 Looking for more Martini Glass Belly Ring similar ideas? Try to explore these searches: Plush Valentine Monkey, Vintage Metal Beauty Sign, and Ostrich Coin. 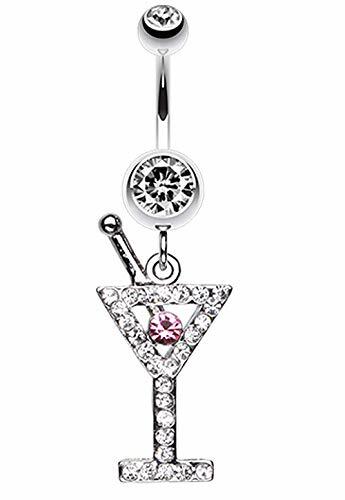 ShopWorldlux.com is the smartest way for save money on Martini Glass Belly Ring: compare prices of leading online stores for best shopping ideas. Don't miss TOP daily updates DEAL.